a variety of workshops are available to fit most timelines and budgets. below are my most popular offerings. Contact me to learn more, receive a quote, and setup a session. Click here to order your own copy of Insight, ready to play! A fun and engaging game to learn about the skills and interests of everyone on a team. Teams can record results in a variety of ways that can benefit team cohesion, role assignments, and team formation. Recognizing individual’s contributions to a team allows groups to capture the most that everyone has to offer to an innovative process. An engaging new twist on daily interactions and communication strategies. 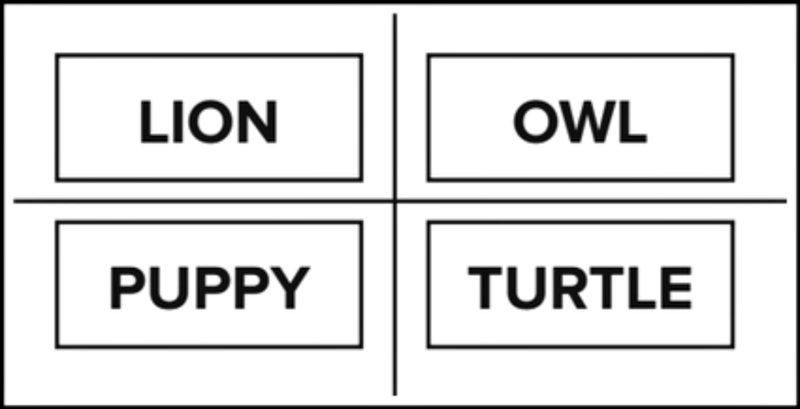 Find out if you are a lion, owl, puppy, or turtle and what that means in a group setting. Using real world experiences and teamwork, participants leave with a personalized reference card and a better sense of how to communicate effectively with coworkers, management, friends, and family. Reach new levels of team awareness and cohesion through an interactive session on how personality type affects communication and work habits. The Myers-Briggs Type Indicator is the most popular personality analysis tool in the world. As a certified practitioner, I am able to guide individuals, teams, and organizations through an in-depth step by step process. Unlike a quick online quiz, participants learn what personality type is and are guided to select their type for themselves. That knowledge is then applied to real world situations such as coworker interaction, stress management, personal effectiveness, and much more. This workshop will help answer questions such as; "how do you prefer to structure meetings?" and "how do you prefer to receive feedback?" A respectful, inclusive, and productive activity and discussion around privilege and the cultural aspects that may lead to differences in daily experiences and systemic opportunities. Cultural differences can be a sensitive topic and require a great deal of trust, comfort, and shared expectations. For groups ready for an impactful experience, this is a meaningful workshop with a lasting impression. A lively group challenge that explores collaboration, communication, and a culture of sharing and growth. Participants work in teams to craft a freestanding tower from a variety of materials. Success depends more on communication than construction and the takeaways can be applied to everyday workplace scenarios. Mac & Cheese Production - Learn about a "Life of Yes" through a variety of workshops, camps, and events. Evan La Ruffa - Writer, curator, poet, artist, strategist, nonprofit consultant, meditator, and macchiato fiend. Dan Killian - Improv in any career. Team Pete - Team building through the lens of improv.